If you are committed to actively managing a service business, Rotobrush® provides the opportunity to work for yourself, full or part time, and achieve financial freedom. Become a complete indoor comfort service provider by offering clean, energy-smart service solutions such as, air duct cleaning, dryer vent cleaning, insulation, duct sealing and radiant barrier. Start off by offering them all of them or just a few services now and you can add more later. Want to be your own boss and make your own destiny? Rotobrush can help. 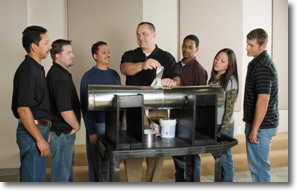 At Rotobrush, starting your new business is easy and profitable. You will have the ability to build your income at your own pace. Commitment to actively manage a service business full or part time. Willingness to invest approximately $10,000 - $15,000 (financing available). 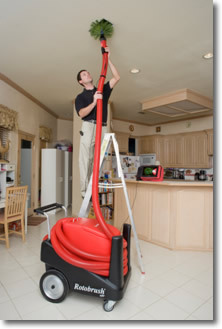 Ability to transport equipment and perform air duct system cleaning and other energy efficiency tasks. Rotobrush® provides anyone committed to actively managing a service business the opportunity to work for yourself, with the flexibility to work full or part time, and achieve financial freedom, with NO franchise fees. Become a complete indoor comfort service provider by offering clean, energy-smart service solutions such as home energy audits, air duct system cleaning, insulation, duct sealing and radiant barrier. You will have the ability to build your income at your own pace. With every 3 to 4 complete indoor environment solutions jobs you could earn up to $15,000 in revenue! Now more than ever, home and business owners want to save money on energy costs while taking advantage of energy efficiency tax credits*. And you can help. Indoor air quality and energy efficiency offer a fast growing opportunity for entrepreneurs. And it's highly profitable. That's because consumers value the safety and comfort of their homes, the quality of the air they breathe, and saving money on their energy bills. A professional business Web site, press releases, marketing materials, tips, templates and more! You can get started quickly and easily, and gradually grow your business. When you partner with Rotobrush, you remain independent and without franchise fees, but you get all the equipment, training and support you need. So, you can be in business for yourself but not by yourself. Indoor air quality and energy efficiency offer fast growing opportunities for entrepreneurs. And they are highly profitable. That's because consumers value the safety and comfort of their homes, the quality of the air they breathe, and saving money on their energy bills. Click on Request Information button above for FREE information on how to start a Rotobrush franchise today! Please Note: Rotobrush opportunities for sale, and other franchise opportunities, business opportunities, businesses and franchises for sale on this web site are not to be considered as an "offering", "franchise offering", suggestion or recommendation by GlobalBX. The franchises, businesses and business brokers seen on this web site submit their own individual content. This advertisement depends entirely on the truthfulness of the information provided by our advertisers which includes, but is not limited to, franchisers, franchises, franchise brokers, franchise consultants, business sellers and business brokers. As always, GlobalBX recommends that you consult a lawyer, financial consultant, accountant or professional advisor before buying a franchise or business opportunity or any type of business. By submitting this form and requesting more information, you have agreed to all terms and policies of GlobalBX and the business and franchise offerings listed here. Please review our Terms & Conditions for more information.